I love this time of year when I can grill outdoors leaving the cleanup to a burning fire with virtually no mess inside – making entertaining easy! If you’ve got friends coming over why serve the traditional burgers, chicken and hot dogs you always do when you can grill Beef Fajitas? 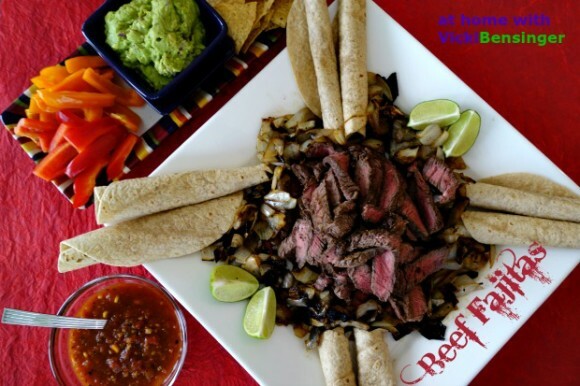 Fajitas a Tex-Mex cuisine, is casual like your typical fare, only more fun to play with. Set up a table spread with plenty of fixings for everyone to create their own dish. I like mine with grilled balsamic onions, black beans, guacamole, plain Greek yogurt, and salsa. Place these ingredients on a store bought or homemade tortilla wrapped up, and enjoy a flavorful meal! 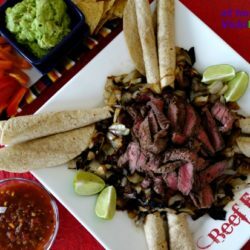 Typically beef fajitas are prepared with flank or skirt steak. 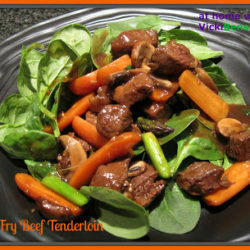 Though it’s extremely flavorful, it is one of the tougher cuts of beef. Since we would be grilling this, it’s important not to overcook it. The trick is grilling it over a very hot grill for a short time, and allowing it to rest for approximately 5 minutes, then slicing it very thin, against the grain. This is especially important; otherwise the muscle fibers will be chewy. It’s common to marinate flank steak, which adds flavor and can help prevent it from drying out on the grill, but it won’t tenderize it. 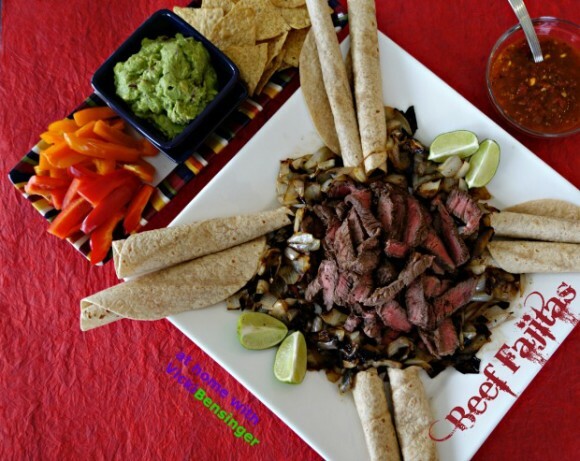 Although everyone I know loves flank steak my family prefers I make our beef fajitas with a boneless sirloin steak, eliminating the issue of being chewy. 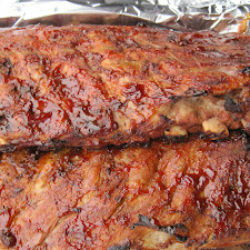 The recipe below has few ingredients in the marinade, but creates outstanding flavor. Paired with balsamic grilled onions your guests will finish every last bit – so you might consider doubling this recipe. Stir together lime juice, 2 tsp salt, and 2 tbsp. olive oil in a small bowl. Toss onions with 1 tbsp. olive oil. Grill onions in a grill basket approximately 20 minutes or until tender. Transfer to a cutting board. When cool enough to handle, chop onions into 1-inch pieces. Toss with vinegar and ½ tsp salt. Remove meat from marinade, and pat dry. Add freshly ground pepper. Grill steak 3-5 minutes per side (medium – medium/rare). Allow to rest 5 minutes, and then thinly slice on the diagonal. Place tortillas directly on grill, turning once, until puffed and slightly browned. Serve steak, with grilled onions, and optional toppings if desired, in warmed tortillas. Love fajitas! Never had them until we moved to Texas (this is back in the 1980s), but learned to love them there. Yours look terrific! Perfect for Cinco de Mayo. 🙂 Thanks! This is a great recipe John and so simple. The flavor of the lime soaks in and makes these so tasty especially with the balsamic onions. I think you’ll enjoy these. wow, the beef is cooked so perfectly, Vicki. And I love the flavours of your fajitas. Super yum!! Thank you Angie and they are so flavorful. Yes you’re right they are perfect for a party and so much fun to build your own. YUM! We love fajitas at our house, but I tend to make chicken. I love your simple marinade—and serving with balsamic onions sounds sublime. Thanks, Vicki!!! I use to love chicken but now my favorite are these beef fajitas. They’re so good! When I make them for my family they’re completely gone. They’re so tasty we can’t seem to get enough of them. I wish I could dig into that platter and make a couple of fajitas, Vicki! I love all of those flavors. I hope you’ll try them Susan, I think you’ll like them. I’m not grateful enough that I can use the grill outside 365 days a year. I’ve been craving fajitas and burritos lately so this is a welcome post! I’ve been the same way. It must be all the commotion about Cinco de Mayo, It has me craving everything tex-mex. Awesome fajitas Vicki!!! Love grilling season and what a perfect way to start the season! Thank you MJ. I hope you’ll try them. They’re so simple to prepare yet packed with flavor. This is one of my favorite things to order out and I would love to make them more often at home! Love the use of balsamic here! I hope you’ll try them, they are so good and easy! 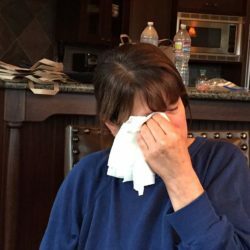 I have never made fajitas…yours sure look great Vicki…the steak sounds and looks delicious! Seriously? 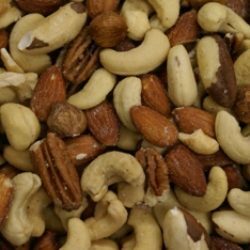 Well then you need to try these because not only are they delicious but they are simple! There’s nothing better than fajitas for kicking off the barbecue season! I agree although I have to admit we have them year round. I hope you’ll give these a try.